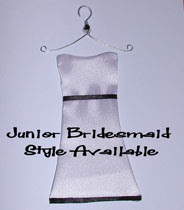 The junior bridesmaid card is slimmer and less curvy than the traditional strapless bridesmaid style offered. This one was a little tricky, what with the bottom edging. Turned out real nice, though!